After years of languishing, many poets probably thought they’d never see this day come: Poetry is popular again! 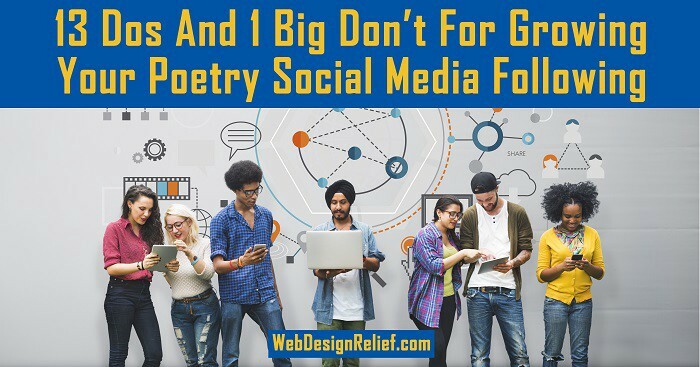 There’s a new generation of poets — dubbed “Instapoets” due to their success on Instagram — and these social media-savvy bards are commanding audiences in the hundreds of thousands while enjoying drool-worthy book sales! Learn the etiquette. You don’t have to focus on Instagram to become a celebrity poet. Choose a platform you like! But be sure that you have a deep understanding of its rules — both formal and informal — as well as its etiquette, sensibility, and intentions. Help yourself. There’s a personal development movement in the uplifting verses of many Instapoets. And is it any wonder? Our challenges make us grow — and profound inspiration inspires profound response. Confess. Confessional poetry has a big audience among social media users, so don’t be afraid to share your raw, #nofilter experiences and emotions. A big emotional wallop leaves a lasting impression on readers. And unforgettable images — both metaphorical and visual — can catch your readers’ attention. Embrace your passions. What really fires your engine? What makes you obsessed? When you share your deepest passions with readers, you may move them to empathy. Embrace the self-portrait. Confessional poets are the subject of their own poems — and Instapoets often put their portraits front and center regularly on social media accounts. Post often. Long silences may be poignant in poems or conversations — but not on social media. Online, your followers will quickly move on if your social media platform gets stale. Quote yourself. Choose your best quotes and incorporate them into images that followers will want to share and share again. Shorter poems — little poetry snacks instead of ten-course feasts — seem to be fan favorites. Monetize, merchandize, and advertise. Create your own collection of poems to sell. Create T-shirts with your best quotes. Book advertising space, guest blogging spots, or pay-to-play mailing list slots. You don’t have to wait for organic notoriety to spring from the fertile fields of the Internet — instead, create a marketing campaign! Poetry purists might argue that there’s no room in poetry for considerations of marketing. It’s the words that should come first (and last, and in the middle too) — not some aspiration to become an Internet meme. Readers can sniff out imposters like teens hunting for free Wi-Fi. Author’s Submission Service Est. 1994. We help authors reach their publishing goals with targeted submissions to literary agents and editors.